When he was born 13 years ago, Connor Johnson was a "miracle baby,’ according to his parents. Kathleen and Curtiss Johnson had struggled for years to become and stay pregnant. They had given up hope, when they discovered they were nearly four months along. The miracle of Connor’s life took on new poignancy in the fall of 2015, when the young teen was diagnosed with an aggressive form of childhood brain cancer. 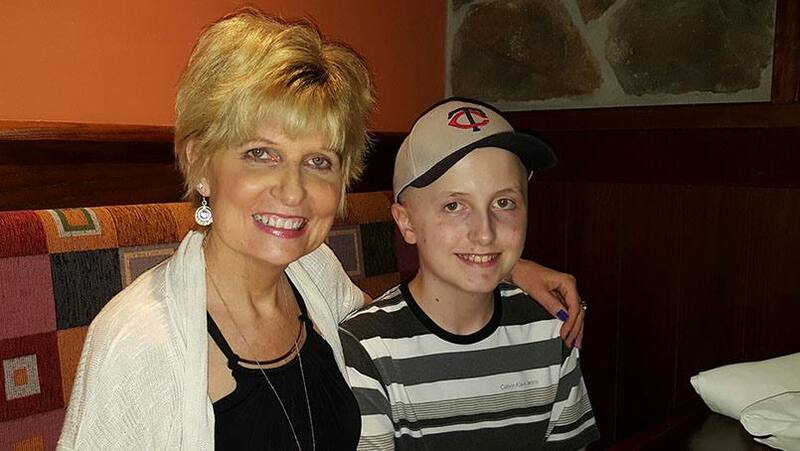 Despite the seriousness of the tumor, an intensive treatment regimen at Mayo Clinic’s Rochester campus involving brain surgery and proton beam therapy, provided Connor and his family the promise of a brighter future. Connor was a typical, sports-loving kid when he began having episodes of double vision and headaches. Having raised another teenager who experienced headaches during puberty, Kathleen chalked up Connor’s symptoms to adolescent growing pains — until one morning just before Thanksgiving. Connor woke that day at 5 a.m. with such extreme head pain it caused him to vomit. Connor’s pediatrician examined him and drew some blood. An MRI and an eye exam were ordered, but when Connor’s blood results came back normal, the pediatrician cancelled the MRI. The doctor also believed the eye exam unnecessary, Kathleen says. At the appointment, Kathleen recalls that the resident physician said nothing while examining Connor eyes. After a long look, he rose and stated that he needed to get the supervising physician. After his own inspection, that doctor reported Connor needed an immediate MRI. Connor’s optic nerves, which attach directly to the brain, were extremely swollen. The MRI was done the Wednesday before Thanksgiving. After the scan concluded, Kathleen dropped Connor off at home and went to the grocery store. She began filling her cart in preparation for a houseful of holiday guests. Midway through shopping, her phone rang. It was Connor’s pediatrician. When the family arrived at Mayo Clinic Hospital – Rochester, Saint Marys Campus, Connor’s physicians shared the results of the MRI. A medulloblastoma had taken root in the back of his brain. It was a stage-four, egg-sized cancerous tumor that was pressing against his brain stem. Typically, when medulloblastomas are discovered, they’ve advanced to a stage where treatment must begin immediately. Worried that Connor might have a seizure or develop a blood clot before the surgery, his physicians admitted him to the pediatric intensive care unit at Saint Marys. Kathleen stayed with Connor that night and the following day. During the stay, Connor’s physicians met with Kathleen and Curtiss to discuss the scope of the operation to remove the tumor, which was scheduled for early Friday morning. At 7:30 a.m. the day after Thanksgiving, Kathleen and Curtiss walked their son to the operating room. The surgery lasted exactly six hours. Each hour that passed was accompanied by a phone call from the surgical room with an update. “Those phone calls helped so much because they let us know he was alive, for one thing, but that he was doing good,” Kathleen says. Three days after his surgery, Connor was released from the hospital. Being at home was initially a challenge. Connor needed a walker to help him move around. He also had physical and occupational therapy to aid his recovery. Support from his Mayo Clinic physicians helped the family manage the situation. The family met Amulya Nageswara Rao, M.B.B.S., Connor’s oncologist, after his surgery. She was confident they could create a successful treatment plan for Connor moving forward. With the right combination of treatments, including surgery, radiation and chemotherapy, medulloblastomas are among the cancers that often can be cured, she says. Six weeks after his operation, with his physical recovery well in hand, Connor’s treatment progressed to the next phase: a six-week course of proton beam radiation therapy. While conventional radiation therapy and proton beam radiation therapy have the same effect on cancer, proton beam radiation minimizes damage to healthy tissues. By directing electrically charged protons, which have been accelerated at two-thirds the speed of light, through a synchrotron, and using a patient’s imaging as a guide, physicians can precisely target the tumor with high bursts of energy that break apart the tumor’s cells beyond repair. Every day for six weeks, Connor would lie still on a table — initially for 90-minute sessions and later for 45-minute periods — to receive a directed beam of highly intensive radiation to his brain and spinal column. In addition to radiation sessions, Connor began receiving chemotherapy to battle any residual cancer cells. Connor’s chemotherapy regime extends across at 10-month span and requires him to stay in the hospital to receive the treatment over a two- or three-day period. His last month of chemotherapy is scheduled for January 2017. Dr. Rao, who treats about five or six children a year with similar tumors, says Connor’s personality made a big difference in his ability to tolerate his treatments. Though his treatments are unquestionably difficult, Connor has the ability to take them in stride. Already his cancer experience has influenced Connor’s thoughts on his future. Whatever his future has in store, it will be one filled with gratitude and appreciation, Kathleen says. Read about the Mayo Clinic Cancer Center. Learn more about the Proton Beam Therapy Program at Mayo Clinic. Connect with others talking about living with a brain tumor on Mayo Clinic Connect. Explore Mayo Clinic’s Rochester campus.